Tonight I got several glazes/layers done.... 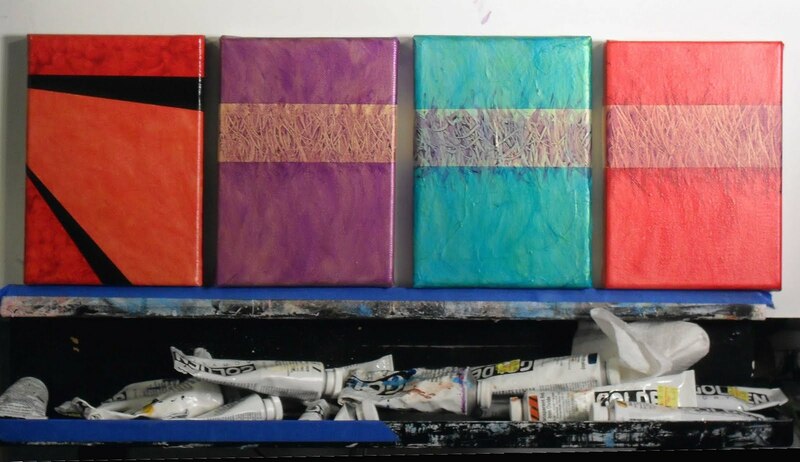 The painting on the far left of the pic is a mini Grid painting that I finished up tonight. The little Band paintings aren't photographing very well, but I typically have this problem when I use the irridescent gold underpainting. In person, the paintings are so rich...they gleam/shimmer, but on camera they just have a lot of glare. Anyways, I'm happy with how they are turning out so far. I should only have about 1 hour left on each of them, so I'll be finishing them up over the weekend. (YAY!!) I still haven't gotten around to doing more sketches yet, but I should have time this weekend. Maybe I'll photograph the sketches and put them on the blog. ??? ?